We went to see "Dr. Mike" yesterday for the follow-up after surgery. Billy Ray is doing really well and can even slowly start back on general diet which pleased Billy Ray greatly. Last night he had a chicken patty and mashed potatoes. He was absolutely delighted and a bit mad at me because I wouldn't let him have more. I was being cautious because he ate too much at lunch and it made him sick. It will take time for his stomach to be able to handle larger quantities. 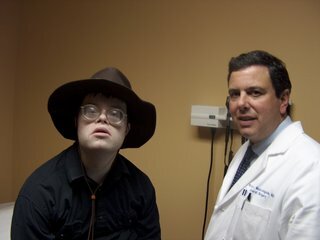 While the surgery (the Nissen) is not just for Autistic children, Dr. Mike said that is necessary for many and that they do really well afterwards. Billy Ray certainly is recovering very rapidly. I am so happy that Billy Ray is recovering so well and able to eat regular food now. Billy Ray looks rather mysterious in that hat :)and quite handsome too! Billy Ray looks great Peggy! Lora is right, he looks very mysterious in the hat. He is one cool dude!